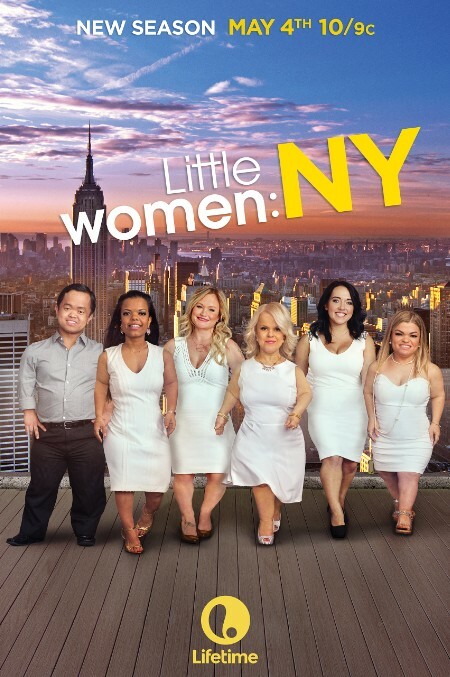 Little Women: NY is back with some old faces, some new! Original cast member and chaos ringleader, Lila Call will join her old buddies Dawn Lang, Jason Perez and Jazmin Lang to navigate being little people in the big city. Gone for season 2 are Jordanna James, Misty Irwin, and Kristin Zettlemoyer. Little Women: NY Recap – The Big Question! So far, this season of Little Women: NY has been bringing us a lot of bickering, but not much substance. But on this week’s finale episode, things get a bit more real (well, for “reality” TV, that is!). We begin at the ice skating rink with Kristin Zettlemoyer, Jason Perez, Jordanna James, and Dawn Lang, who have all just returned from their Puerto Rico trip. Dawn’s not skating because of her brittle bone disease, which puts her at risk for broken bones easily. Kristin and Dawn have mended fences, as have Jason and Jordanna. But Misty Irwin is the new target of everyone’s anger because of her wishy-washy behavior, disloyalty, and general inability to tell the truth (as Kristin sees it). Everyone’s drinking the haterade at the rink, though, and jumps on board bashing Misty for basically being a bad friend. Because Kristin lives with Misty, she’s stressing the most over the situation. But stress be damned! Because it’s Kristin’s 38th birthday soon and the group wants to throw her a party at which everyone will argue and back-stab. At Jordanna’s apartment later, her boyfriend Anthony tells her he got a job as an air traffic controller (yay!) that means he has to leave her for three months (boo!). She’s thrilled for him, but doesn’t want him to go. Later, Lila Call, Jordanna, and Jason go shopping for Kristin’s birthday bash. They don’t have a venue, cake, or food, but why not shop for costumes first? Good plan. Jordanna knows that Kristin’s biological clock is ticking, so she may not be thrilled about turning another year older. But Kristin’s much younger boyfriend, Josh, will be at the party to cheer her up. Again, good plan (?). They decide on a 1920s theme party, but nix Jason’s fantasy of Josh popping out of a cake wearing nothing but his birthday suit. On last night’s Little Women: NY we begin with the entire group, sans Jordanna James, meeting to hear Jazmin Lang’s trip idea: Puerto Rico! Jazmin’s mother is Puerto Rican and she wants to take everyone to her “home” so they can relax and bond again. Jordanna is invited even though she and Jason Perez are at odds. The group is assembled the next day with rolling bags as big as they are, but they’re troopers and hustle their way into cabs and to the airport. Lila Call says traveling abroad can be tough for a little person, but she just plans to bat her eyelashes to get a little help. The group arrives safe & sounds at their hotel in PR. Jazmin climbs up on her suitcase to reach the check-in desk and, again, props to all of them for getting themselves into their rooms with all the schlepping and struggling of travel! Dawn Lang is still burning up about Misty Irwin and Kristin Zettlemoyer dissing her “big event” last weekend (i.e. : her brokedown charity auction), so she plans to confront them at dinner. In another room, Jordanna is complaining to Kristin about Jason’s ridiculous behavior at Dawn’s event in throwing Jordanna publicly under the bus. For her part, Kristin is not feeling Dawn lately and tells Jordanna that she’s ready to snap if Dawn rubs her the wrong way on this trip. So, bring on the dinner confrontation! 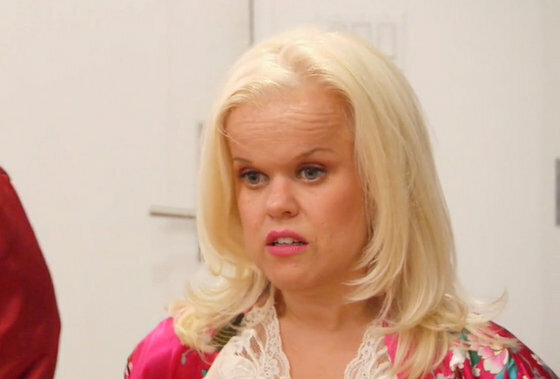 On last night’s Little Women: NY, we pick up smack in the middle of the fight between Misty Irwin and Jordanna James, courtesy of Miss Jason Perez‘ pot-stirring. Jordanna has been invited to model in the Paris Little Person Fashion Show, which Misty is seeing red over. Jordanna rightfully calls Jason out on his dramatic behavior and tries to reason with an irate Misty, but her advice “to get thick skin” falls on Misty’s deaf ears. The two women do hug it out at the end, and the whole scene seems a bit scripted. So, meh. Guess that’s over…for now! The next day, Lila Call takes Jason along to her dog’s vet appointment. She pulls dog poop out of her purse for vet inspection, which is lovely. Jason’s dad is the vet, and also the happy recipient of Jason as a boomerang house guest for life! Jason is still upset with Jordanna for calling him a coward for moving back into his parents’ home, but methinks Jason’s not facing the real issue at hand here. #youknowhwhatimean Jason’s dad teaches Lila some lessons about Filipino respect, like not looking directly into your elders’ eyes and forcing your closeted son to live with you for the rest of his natural life. Little Women: NY has been bringing us plenty of drama courtesy of Lila Call and Dawn Lang in the past few weeks, but last night the storm clouds shifted toward the tension brewing between Misty Irwin and Jordanna James over their “warring” jobs in the Little People Fashion Show. We begin with the aftermath of Jazmin Lang & Dawn’s argument over Lila’s sobriety – who’s supporting her, who’s not supporting her, who’s her puppy dog, yadda yadda. Dawn the Power Ranger is deflecting the crap out of Jazmin’s main points, ultimately accusing Jazmin of taking anti-anxiety meds from Lila at Lila’s intervention. Which has nothing to do with anything. Or does it? Lila comes down to tag out Jazmin as Dawn’s next victim, then Jazmin comes back to double team with Lila on Dawn. Dawn finally retreats to the comfort of the couch with the rest of the group while Lila & Jazmin scurry to a nearby bedroom to ponder why Dawn is such a total mean girl. In tears, Jazmin says she just can’t deal with Dawn anymore, sister in law or not: “First time, shame on her, second time, shame on me,” she says. So, is she really done? In last night’s episode of Little Women: N.Y., the ladies (and Jason Perez) travel to the Catskill Mountains for ski trip at the behest of Kristin Zettlemoyer. Lila Call struggles with her sobriety, while Jazmin Lang and Dawn Lang take advantage of the close quarters on the trip to completely trip out on each other. We start the show with Jordanna James visiting Misty Irwin to hear her big news: Misty is going to walk in a fashion show in a $100 bill skirt and crop top. Jordanna confesses that she’s going to be walking in the same show and Misty’s not happy about her thunder just being stolen. Misty’s all “well, if you wanna do it then do it.” But she looks like she’s going to punch Jordanna in the face while she’s saying it. Meanwhile, Dawn is taking Lila to the gym to get her into healthier activities now that Lila has recommitted to her sobriety. Lila apologizes for basically calling Dawn an alcoholic too (at Lila’s recent intervention), but Dawn’s a$$ is still chafing at the accusation. Dawn pledges not to drink around Lila to support her recovery, though she calls out Jazmin for not speaking up during the intervention as much as she should have. Lila sees Dawn’s shady motives in throwing Jazmin under the bus, but leaves it alone for now.